HeartWatch 3 tips are here. 1.1 Not seeing Heart Rate, Energy or Sleep Data. 1.7 Help! I Forgot to End My Sleep! 1.10 Keep Getting One Time Setup? 1.11 Don't Know Where to Enter Date of Birth? 1.12 I Can't Find the Glance! 2.4.3 What is Basal Energy? 2.4.4 How is Restlessness Calculated? 4.4.1 Adding a Measure - Weight, Fat, Blood Pressure etc. 4.4.8 Sleep Tracking: What About Battery Life? Not seeing Heart Rate, Energy or Sleep Data. This is normally due to HealthKit permissions. Heart Watch reads your heart rate data via your iPhone's Health Data Store. When you first launch the app it will ask for your permission. It's important that you provide your ok for all this information as it is required for all the required calculations. If you were accidentally a bit quick doing this and missed granting permissions, then you can do this at any time by going into iPhone Settings, Privacy, Health, selecting Heart Watch and turning the required permissions on. If you are not seeing anything you have entered on the Watch, such as sleep or measurements then pay particular attention to the write permissions. If you have disabled "Wrist Detection" in your Watch settings, General panel, or have set your watch to low power mode, this can result in your Apple Watch no longer taking automatic heart rate readings throughout the day. Occasionally you will experience a minor delay while your Watch writes health data to your phone and the health store does its updates. These are generally minor. You can pull the Heart Watch summary screen down at any time to get the latest update. If you are seeing your heart rate data in the HeartWatch iPhone app, but not seeing any data on your HeartWatch Watch app, then this is likely a HealthKit permission problem. To fix, follow these five steps. 1. Remove the Watch app from your Watch. 2. Reboot the Watch by simultaneously pressing the Crown & Side button until you see the Apple logo appear. 3. Reboot the iPhone by simultaneously pressing the home button and the sleep wake button until the Apple logo appears. 4. Once both devices are back to life, wait a few minutes until they are both happy and communicating. 5. Re-install the Watch app. This should fix most cases of not seeing data on the Watch. If you are still having problems, please email us. There is a very good chance we can help you with your Watch problems and get everything working. Unfortunately if you decide to post your problem as a review on the App Store, there is no way we can help you as it is not possible for us to contact you by this means and this is really depressing as we want to help you. 1. In iPhone settings, General, Background App Refresh, there is a switch at the top of the screen called 'Background App Refresh'. This needs to be turned on. 2. In the same screen, Scroll down to HeartWatch and also make sure that this is turned on as well. It important to understand that your iPhone encrypts all your health information, and prevents access by any application (even Apple ones) unless your phone is unlocked. Heart Watch will process this information in the background any time your phone is unlocked, no matter what application you are using, and once done, will give you any notifications that you've asked for. So, as long as you use your iPhone you will get any notifications you've asked for without having to specifically open the Heart Watch app. Help! I Forgot to End My Sleep! Go into the Apple Health App. Press the Health Data tab. Press Sleep, then Sleep Analysis. Now press "Show All Data"
Locate the offending "Asleep" entry and swipe to the left on it to delete. Now, go back and press "Add Data Point" to add a new "Asleep" entry. Now when you go back into HeartWatch everything will be re-calculated for you automatically. This is actually nothing at all to do with the HeartWatch Watch app. The most common reason for this is the installation process, that is managed between your iPhone and your Watch has failed to end gracefully and sits there chewing up power. The way to fix this is to reboot both your iPhone & your Watch. Reboot the Watch by simultaneously pressing the Crown & Side button until you see the Apple logo appear. Reboot the iPhone by simultaneously pressing the home button and the sleep wake button until the Apple logo appears. When you are active, by default your Apple Watch will not take automatic heart rate readings. When exercising, you need to tell your Watch that you are doing a workout. This changes the heart rate monitoring mode to the high sampling rate. To do this, you can either use the inbuilt Apple Watch workout app or whatever your favourite workout is that writes workout data to the Apple Health database (HealthKit). Always remember to end and save the workout. This will write the workout information to the Apple Health database and allow it to show in the HeartWatch iPhone & Watch apps. Keep Getting One Time Setup? Force close HeartWatch app by double pressing the home button and swiping it upwards. Scroll down to HeartWatch and select. Turn support parameters 1 & 2 on and then off. The next time you go into the HeartWatch app and are asked for one time setup, then let it complete. You won't be asked again. Don't Know Where to Enter Date of Birth? Go into the Apple Health app. If you can't find it, swipe right on your home screen until you get to search and then type in "Health". Press the Health Data tab on the bottom row. It's the second one across. Press the Edit button in the top right corner. You can now edit your details. I Can't Find the Glance! There's a good reason for this. There isn't one. The reason is that Glances can't show live data (except for Apple's own - fair enough it is their device after all) and they don't have any processing time on the Watch. So this means that the Glance would only be able to show historical data from the iPhone. However, the top tip is to set up the complication and just tap this. It is actually faster than a Glance and shows way more information. If you aren't sure how to add a complication then Serenity from iMore has a nice article here. This section explains some key concepts behind the design of HeartWatch and how heart rate data is represented. Regular heart rate is a term used in Heart Watch to isolate the readings your watch takes in the background every ten minutes from those readings you take during a workout or those taken during sleep. Workout readings are more likely performed under physical stress and an elevated heart rate. By isolating regular heart rate from workout heart rate, Heart Watch can present a more accurate picture of your day to day heart health. It is generally understood that a regular resting heart rate is from 60-100 bpm though resting heart rates from 50-60 bpm are common amongst healthy individuals. By default, HeartWatch uses the following colours and zones to present your regular heart rate data, both in heart badges and charts. Keep in mind that this is not medical advice. If unsure of anything, always consult a medical professional. Red: Greater than or equal to 100bpm. A sustained resting heart rate above 100bpm may indicate tachycardia. If your regular heart rate badge is mainly red, you should consider seeing a health professional. Purple: Greater than or equal to 80 & less than 100bpm. Though this does fall within the parameters of a regular resting heart rate, it is on the high side. Depending on your level of activity or consumption of stimulants, this may indicate that you aren't particularly fit/healthy if you are consistently seeing that your badge is nearly all purple. To help in determining how active you have been, HeartWatch overlays your active energy level when you press the badge to see the details of what makes it up. Blue: Greater than or equal to 55 and less then 80bpm. This is recognised as a healthy resting heart rate. Ideally your badge should be at least half blue. The more blue, the healthier your heart is likely to be. You should however, consider the type of day you have had though. If you have been very active, then purple may be a reflection of what you have been doing (see above). Pinkish Brown: Lower than 55 and greater than or equal to 40bpm. If you can see a significant pinkish brown centre in your badge, and you are experiencing fatigue, weakness, dizzyness or feel faint, then this may indicate bradycardia. If you don't have any symptoms, and particularly if you are a well trained athlete this likely isn't a problem. Again, consult your doctor especially if you are experiencing symptoms. Brown: Lower than 40bpm. Unless you are a very highly trained athlete, a brown centre in your badge or even seeing a percentage of readings in brown is likely not a good thing. If you are experiencing any fatigue, weakness, dizzyness or feeling faint then even more so. Probably a good idea to see your medical professional. In the Heart Watch info menu, you can customise which colours are associated with your heart's beats per minute (BPM) reading during presentation of regular heart rate readings. For example, if you are a highly trained athlete, your resting heart rate may be lower than 55 and you may choose to alter the colour band values. Studies have shown that your waking heart rate is an important measure of your basic fitness level and a strong predictor of your cardiovascular health. A normal adult range is from 60 to 80 beats per minute. Athletes can have a range between 35 to 50 beats per minute. Generally speaking, the better shape you are in, the fewer beats per minute. Having a high waking heart rate can be an indication of poor cardiovascular health and can indicate things such as hardening of the arteries and restrictions in the diameter of your blood vessels. If your waking heart rate is over 80bpm, then you should consult your medical practitioner. For athletes, monitoring the variance in waking heart rate can be useful in monitoring overtraining. There are two ways to capture your waking heart rate, depending on whether you use HeartWatch's sleep tracking feature or not. If using sleep tracking in the Watch app, there is a handy 'Take Pulse' option when you finish sleeping. Using this will ensure the most accurate way of tracking your waking pulse. Whilst still in bed, put your Apple Watch on to your wrist & enter its PIN. This will trigger an immediate heart rate reading in the background on your Apple Watch. However, reaching across and moving around might cause your heart rate to elevate slightly. The way around this is to flick up the heart rate glance on your Watch and then lie still and relax for about 30 seconds. This will capture more accurate readings. Close the glance and that's it. You're done. When the app later analyses your heart rate, it will review and consolidate this information automatically to provide a more accurate waking heart rate. By default, if you do not use sleep tracking, HeartWatch will use the first reading after 4AM that it finds. You are able to customise this in the info menu by changing the hour to something more appropriate for you. If you do not want to see the Waking Section then you can also stop it from being displayed by turning off the switch under the Show Waking Section? heading within the info menu. When you start and end a workout on your Apple Watch, Heart Watch will use this information to isolate and present this heart rate information in a separate section. Each workout will appear with its own badge and all workouts for a day consolidated under a zonal summary. For workouts, the zones are based on percentage of max heartbeat which is very popular with “zonal” style training. Percentages are used to give a common reference over different ages & levels of fitness and to allow individual adjustment based on training level. Aqua = moderate zone (50-60% of max) - won’t increase fitness/strength/endurance but good for health, recovery, warm ups, cool downs etc. Green = fat burning zone (60-70% of max) - lowish effort, predominantly uses fat for energy. Yellow = aerobic fitness zone (70-80% of max) - builds functional capacity, lung capacity, respiratory rate, numbers & size of blood vessels etc, metabolises fats & carbs around a 50/50 rate. Red = anaerobic threshold / intense zone (80-90% of max) - getting faster & fitter via more intensity. Bright Red = extremely intense (90-100% of max) - full on effort for short bursts only during interval training. Purely anaerobic. Anything below 50% of your max heart rate will show in the default resting colours. Something to look out for is if you are also seeing light or dark brown readings and experiencing light headedness during your workout. Rapid fluctuations from red to brown are of particular concern. This may indicate an underlying heart problem that you should discuss with your medical practitioner. As with any exercise, be sensible. Unless you are an elite athlete, or experienced trainer, it is likely sensible to stay yellow or lower as you build your fitness and adapt to training loads. In the HeartWatch info menu, you can customise how the various heart rate zones are presented in the workout section. Each colour can be associated with a percentage of your maximum heart rate. Your maximum heart rate itself may also be changed, by default, it is based on your age. The sleep section relies on you capturing both heart rate & when you started and finished sleeping. This is made somewhat easier in HeartWatch 2 as there is a sleep tracking function built into the Watch app when you Force Touch the app's main screen. However, you don't have to use this. If you have a favourite iPhone app (or even another Watch app) that you use for sleep tracking/alarm that writes sleep data into HealthKit, you can still use this. You do however have to wear your Watch whilst sleeping otherwise you won't be tracking your sleeping heart rate nor your restless energy. If you are concerned about battery life, there are some handy tips here. Your Apple Watch captures your active energy and basal energy whenever you are wearing it. This includes while you are asleep. This is, like heart rate data, written to the Health database on your iPhone. The HeartWatch app reads your sleep start and finish, the basal energy you used and any active energy. It uses an algorithm to compare the active energy to the basal energy and determines how restless you were during your sleep. This is then graphed over your heart rate in a top down format (where the top y axis = 0). It also uses a z axis by plotting activity that has occurred in overlapping times to form a deeper green which indicates greater intensity of movement. In practice, any waking events can be seen as bars that have descended the red line. This restlessness data is then used along with how long you have slept to determine to what extent you've "recharged your batteries". By default, this works based on an average of 8 hours quality sleep. If you feel that you require more or less hours of sleep per night, then you can change this in the info section. The trailing week recharge battery symbol is based on the weighted average of up to your last seven days' sleep. This a fairly non-scientific analysis of your sleep but does provide a handy indicator as to whether you are starting to incur a sleep deficit. You'll likely notice anything below 90% and especially feel the effects of anything below 80%. Future updates of the app may include automatic sleep recording and a deeper analysis of sleep zones. We'd love to hear your feedback. Basal energy expenditure (BEE), also known as basal metabolic rate (BMR) is the amount of energy needed to carry out fundamental metabolic functions, such as breathing, ion transport, normal turnover of enzymes and other body components, etc. So while sleeping (and also throughout the day), there is a base (basal) rate of energy that you burn while doing absolutely nothing. The Apple Watch records this whenever you are wearing it. Now, active energy is any energy you burn over and above that required as basal energy. This is due to needing to fuel physical movement. Again, your Apple Watch also captures this. For restlessness calculations, HeartWatch identifies the basal energy requirement that your body had while asleep. It then looks at active energy expended during this time and uses an algorithm to identify the intensity of this activity versus baseline. The simple percentage you see is, the active energy you have burned over and above your basal energy requirements which provides a nice way of seeing how restless you were. The green energy graph you see overlaid over the sleeping heart rate is where and when this occurred, the strength and intensity. The energy graph has a reverse y axis, where the top = 0 and the bottom is maximal. It also has a pseudo z axis by overlaying entries that overlap each other to cause a brighter shade of green. Most of what you see in the HeartWatch iPhone app can be touched so that you can zoom deeper into something that you want to investigate further. In addition, swiping within a section will show the previous or next day's readings for that section. For workout data, as you may not workout every day, it will skip days until it finds the next or previous workout. The HeartWatch complication is the most convenient way to launch the watch app and also provides useful information. Whenever the iPhone is unlocked, it is able to receive system notifications about changes in your heart rate. You don't have to be using the HeartWatch app for this to happen, just have your iPhone unlocked. The reason for this is that the HealthKit database is encrypted and inaccessible by any means while your iPhone is locked. The HeartWatch app will read any heart rate system notifications since you last opened the app, and determine the highest reading since you either opened the iPhone app or the Watch app. It will then update the complication with a red outlined heart with this reading. This serves as a convenient method to let you know how high your heart rate has been since you opened the app. Whenever you go into the iPhone app or the Watch app, the complication will update to a solid heart and show your current average heart rate for regular time. In the modular complication with the coloured face, this is coloured red, for all others it is solid white. When you have told the app that you are going to sleep, the complication changes to a crescent moon and displays the elapsed time since the sleep session began. The HeartWatch Watch app has two modes, regular & active workout. Regular is like a much simplified version of the iPhone app, showing average, maximum and minimum heart rate for the key sections of regular, workout and sleep. In the regular section the variance percentage that appears below the average shows the change in average rate since you last opened the Watch app. When the HeartWatch watch app is reading & processing the day's heart data, it will show as a red outline. Once this has completed, the heart icon will appear as a solid red heart. The Watch app refreshes once each time that it is started, and whenever you tilt your wrist or touch the screen again after the screen has gone black. Whenever you reach a new high heart rate that is both higher than the value you have configured in the iPhone app's Info / Notifications / Heartrate Exceeds setting (default is 100) and higher than your previous high for the day, the Watch will give you a light tap and the maximum heart rate will appear in bright yellow until you perform another refresh. The Watch app will switch modes into what is called Active Workout Mode when it senses that you are currently in a workout. It relies on you starting and ending your workouts in any other app that you are currently using for this, such as the built in workout app. It will switch into Active Workout mode once you have been in a workout for longer than 60 seconds. Active Workout mode show the latest reading on the top line, and when. Below this are two large numbers colour keyed into the HeartWatch colour scheme for workouts. The number on the left is the average of the last 3 readings. The number on the right is the average for the entire workout. This gives you a quick sense as to what zone you are in now and for the workout as a whole. Below the two big numbers are the duration of the workout and the low and high readings. As with regular mode, when the HeartWatch watch app is reading & processing the workout heart data, it will show as a red outline. Once this has completed, the heart icon will appear as a solid red heart. As with regular mode, the Watch app refreshes once each time that it is started, and whenever you tilt your wrist or touch the screen again after the screen has gone black. In addition, in active workout mode, it will refresh every 10 seconds while it remains visible on your Watch screen. The Active Workout mode is best when you have configured your Watch's wake screen to resume the last activity. To do this, on the Apple Watch app on your iPhone, or, on the settings app on your Watch, select General / Wake Screen and set Resume Last Activity / Previous Activity. What this means is that you can go into the HeartWatch watch app, and whenever you tilt your wrist or tap the screen, it will quickly refresh and show you how your workout is progressing. This is very valuable for when you want to do zonal heart rate training. You will stay in the HeartWatch app until you press the crown to return to the watch face. This is a much more logical and convenient way to use your Watch. From the Watch face, in this mode, you are still also able to return to the workout screen automatically when you tilt your wrist or tap the screen. Force Touching the HeartWatch Watch app's screen will display a menu that lets you record a measure, a note or start sleeping. Adding a Measure - Weight, Fat, Blood Pressure etc. HeartWatch provides a convenient way to add readings and measures into the Health database. This includes body weight, body fat, body temperature, blood pressure, blood sugar and caffeine intake. To add a measure, simply press the + button and this will give you a hints screen in case you have forgotten what is supported. Once you press OK, you then speak what you want to record. Once you have said what you need, press Done in the top right corner and you will be asked to confirm whether you want to add what you just said. "85 point 5 kilograms" - this is to record your weight in kilograms. Siri will convert this to appear as 85.5kg on your screen. "160 pounds" - this is to record your weight in pounds. Depending on your region setting, Siri may transcribe this into a UK pound sign (£). This is ok as HeartWatch will work out what you mean. "16 percent" or "10 point 5 percent" - this is to record your body fat percentage. You can say "16 percent fat" if you want, but "percent" is the important word. Siri will transcribe this to 16%. "120 over 80" - this is to record your blood pressure. Siri will transcribe this to 120/80. "37 degrees" or "98 degrees" - this is to record your body temperature. They key word here is degrees as HeartWatch will work out whether you mean celsius or fahrenheit. Siri will transcribe this to appear as 37°. "Sugar 5 point 0" or "Glucose 98" - this is to record your blood sugar reading. You can say either sugar or glucose and the number can be in mmol/L or mg/dL. HeartWatch will work out which measurement you mean. Note, if the number is a whole number under 10, Siri will need you to say the decimal point in order to correctly transcribe the number into decimal notation. i.e., Don't say "Sugar 5" say "Sugar 5.0". "50 milligrams caffeine" - this is how you can record caffeine intake. Siri will transcribe to 50mg caffeine. Pressing the i button will let you add an info note about your day. This is done via dictation. Once you have said what you need to say, you will asked to confirm. Once you say Yes, the note will written to the HeartWatch iPhone app. If this is an additional note for the day, then it will be added with a carriage return to any existing notes. You can add, change or delete notes in the HeartWatch iPhone app too. You can track your sleep using the Watch app. To do this just press the pause ⏸ button. This will immediately start your sleep session. When you exit the Watch by pressing the crown, you'll see that the complication has changed to show a crescent moon and the elapsed time since your sleep session began. When you go back into the Watch app whilst a sleep session is active, you'll see a single red button entitled end sleep. When you press this, you will see a menu of three buttons, namely, Resume Sleep, Take Pulse and Done. The Resume Sleep button is in case you accidentally pressed the End Sleep button. You sleep is automatically saved to the Health database once you press the red Done button. The sleep must be over 5 minutes in length though or else it is ignored. This provides a way of catering for times you didn't mean to start a sleep session. The blue Take Pulse button is a convenient way of taking your waking pulse once you complete a sleep session. The way that you should use this, after pressing the button, whilst you are still in bed, close your eyes and lie in as a relaxed a state as you can. If your Watch is not in Do Not Disturb mode, you will get a notification after 30 seconds. If not, just lie there in a relaxed state, breathing in a relaxed manner for about 15 slow sheeps worth. Once done, press the Stop button. 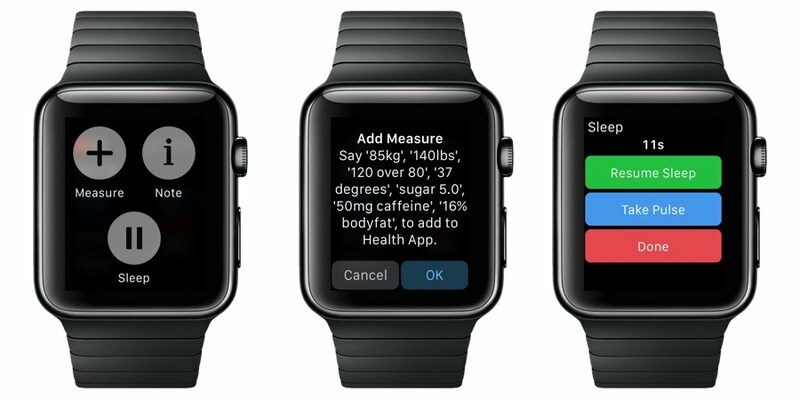 The Watch app will then identify the lowest reading during your session and use this as your waking pulse. Sleep Tracking: What About Battery Life? Many people don't realise that it is possible to track sleep using your Watch as they are concerned about battery life. The most popular way of catering for this, is to do both of the following. 1. After you get up, put your Watch on charge. By the time you've had a shower, had breakfast etc. your Watch will usually be at or close to 100% charge. 2. Before you sleep, while reading or watching the TV etc., put your Watch on charge. With normal use, the Watch should be at or close to 100% after about an hour sometimes quicker if you hadn't done any workouts. Make sure that your Watch is in Do Not Disturb (DND) mode. You do not need to put it into flight mode as battery drain over a night's sleep with DND mode on is usually only around 10%.